The recipe comes from a great blog called “Tess’s Japanese Kitchen”. Tess became a real expert on the subject by working her way through the 250 recipes from this book by Hiroko Shimbo. Pretty amazing! If you are into authentic Japanese cooking, bookmark her blog and get ready to learn a lot from it. And, while you are at it, reserve a bookmark for Ms. Shimbo’s site, Hiroko’s Kitchen. 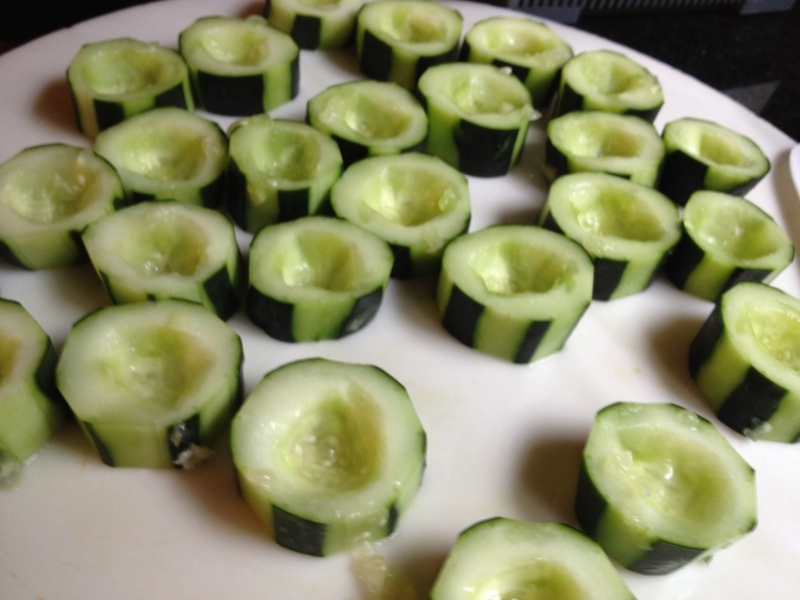 Make the cucumber “cups” by peeling the cucumbers leaving streaks of unpeeled portions. Cut in 3/4 inch slices, and carefully hollow each slice to form a small cup. Discard the pulp. Reserve the cucumber slices, if they seem too wet place them over paper towels to catch excess liquid. Add all other ingredients, except the paprika. Process to make a smooth paste, scraping the sides of the bowl midway through processing. Taste, adjust seasoning, and spoon small portions of the dip inside the hollowed cucumber slices. Serve any additional dip with crackers or crudites. When I brought this platter to a departmental get-together, most people were puzzled, trying to figure out where the green color was coming from. ONE YEAR AGO: Headed to Brazil! THREE YEARS AGO: Golly Moses: She’s a Muffin! Never thought about edamame as hummus, but now I do! Sounds yummy and looks fantastic, just added to “must do” for next dinner party, thanks for sharing! Lovely post. 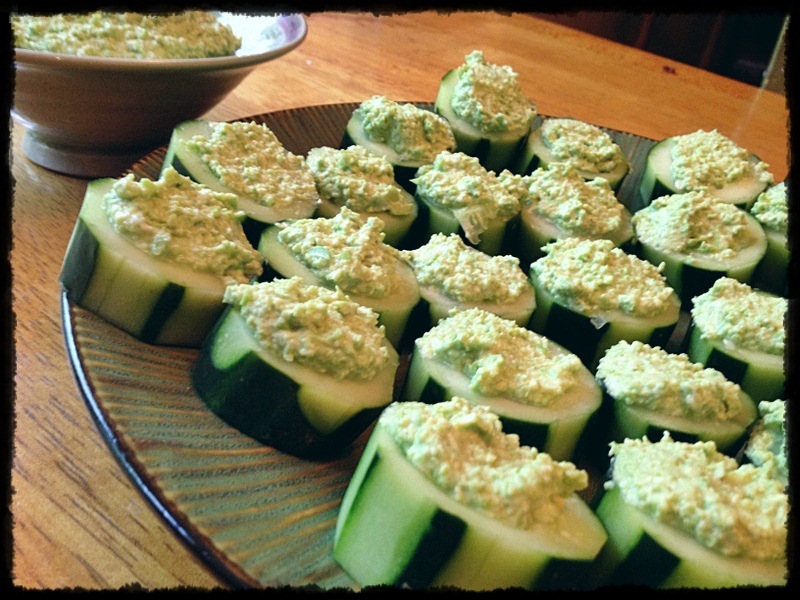 I’d not thought of putting the edamame dip into cucumber cups. It’s a great idea which I will certainly copy. Tess, nice to have you here! Thanks for the recipe and the tips on the article… much appreciated! This is a completely new preparation for edamame for me — and a good one, at that. I keep seeing more and more edamame recipes around, which is a great thing… love them! When I entertain (or snack myself) it always seems that anything low carb is such a hit! And the presentation is party worthy! I could imagine people questioning the “green”, edamame would be unexpected but I also imagine is tastes really good! Love the sound of this, especially the use of edamame to make the filling. I hope you try it, Kalyn… thanks for stopping by! Good to have a lemon freak as a friend! Very cool presentation. I love the dip too of course. What a great idea with edamame – bookmarked. The color of the dip is great with the cucumber! Sounds delicious with the feta too. This is making me want a snack before dinner. What a great idea for a snack Sally – protein rich, cuc bites – so refreshing too! This is one that I could see myself transporting (to a friend’s or the cottage) and assembling sur place. Love the touch of paprika! Great recipe Sally – will check out Tess’s site for sure; thanks. You will love Tess’ blog, I am sure! These definitely would make for some healthier appetizers! I know I’d love to snack on them. Nothing like healthy food that tastes great, don’t you think? I never ate cucumbers in any other way then on salad, so this is one great idea for me! Glad you liked it! Thanks for stopping by…. This one looks great, I just bought some edamame too! Oh, I often do stuff like that… irritating, isn’t it? But I hope you will love this and your guests will love it too! it rocks! I just tasted…..? will is firm up in the fridge a little? I am afraid I screwed up using a whole lemon, is was a small one, so it’s a little looser. it firms up a little yes, but if you think it is too runny, maybe a little more feta could help???? oops….I will remember that next time. I had just enough feta for this…leftover. My sister in law is a thryroid cancer surivor and very health concious, and loves these flavors. A whopping sucess! Left over dip with pita chips! Thank you so much! Awesome! So glad it worked for you! You know, I DREAMED about it last night, in my dream the dip was running like a sauce and making a puddle over the table… NO BUENO! I loved the happy ending, though…. lol…hey I have those dreams too!